Guff Abbott is professor emeritus at the University of Mississippi School of Law. 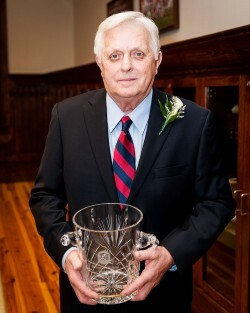 His relationship with Ole Miss began in 1960 when he arrived in Oxford as a freshman. During his time as an undergraduate he was a member of Sigma Nu fraternity. His academic and leadership abilities were recognized with memberships in Phi Eta Sigma, Omicron Delta Kappa and Phi Kappa Phi. After receiving a B.A. in mathematics, Abbott enrolled in law school at Ole Miss. There he was a member of the Mississippi Law Journal, a publication in which he would remain involved for almost three decades. In 1967, Abbott obtained his J.D. degree and moved to Gulfport where he would practice law over the next few years. In 1970, Abbott returned to Oxford to become a member of the law school faculty. During his time as a faculty member, he attended Harvard University and was a Fellow in Law and Humanities in 1975. In 1991, he was selected at the first recipient of the Butler, Snow, O’Mara, Stevens & Cannada Endowed Lectureship in Law. In 1984, Abbott and fellow faculty member, Bob Weems, crafted one of the most popular CLE programs titled, “Summary of Recent Mississippi Law.” For more than 25 years, he also served as faculty advisor to the Mississippi Law Journal. From 1985 to 1987, Abbott answered the call when his leadership was needed by agreeing to serve as interim dean of the School of Law. 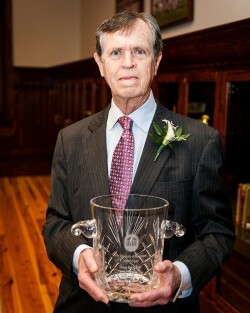 In 2001, Abbott was recognized as the University of Mississippi School of Law Alumnus of the Year. His true talents and passion were most evident in the classroom. He was elected by the Law School Student Body as Outstanding Professor of Law at the Ole Miss law school in 1974, 1976, 1984, 1992 and 2000. In 1986 he was awarded the Elsie M. Hood Outstanding Teacher award, presented annually to only one instructor at the University of Mississippi. Abbott has also been an asset to the profession outside of the classroom. He has played an active role in helping craft the rules that govern the Mississippi Supreme Court. For 32 years, he served on the Mississippi Supreme Court Advisory Committee on the Rules of Civil Practice and Procedure. For four years, he served as chair of the Civil Instructions Subcommittee of the Model Jury Instructions Committee. The Rules Advisory Committee went on to name Abbott’s former spot on the committee the “Guff Abbott Chair.” He is a charter member and original secretary/treasurer of the American Inns of Court III. Abbott is a Life Fellow of the Young Lawyers of the Mississippi Bar, serving as Fellow President in 1994-1995. He is also a Fellow of the Mississippi Bar Foundation. In 1998-99 he held the rare distinction of being a professor of law who was elected president of the Mississippi Bar. At his alma mater, he also found time in 2005-2006 to give back by taking on the role of chairman of the Lamar Order. In his community he has been a faithful servant at First Presbyterian Church in Oxford, serving as Ruling Elder and as Clerk of Session. He is also active with and serves on the executive board of the Oxford-Lafayette County Pantry. Following Hurricane Katrina, Abbott did not hesitate to volunteer are FEMA sites. He has also been part of multiple mission trips to Central America to help install life-saving water filtration systems. Guff and his wife, Patsy, reside in Oxford. Though he was born in Houston, Miss., the Mississippi Delta has long been home for Frank Crosthwait. He is a senior partner at the Indianola law firm of Crosthwait, Terney & Noble, PLLC. 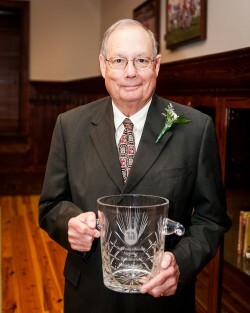 After graduating from Drew High School, Crosthwait made his way to Ole Miss where in 1958 he received his Bachelor’s degree in Business Administration. As an undergraduate student, he was a member of Sigma Chi fraternity and was an Associated Student Body class representative. He went immediately to law school at the University of Mississippi and received his LL.B. degree in 1959. Crosthwait has set a tremendous example of citizenship as evidenced by his service to his state, his local community, his profession and to his alma mater. He is a member of the Mississippi Bar, the District of Columbia Bar and the American Bar Association. His dedication to the Mississippi Bar began at an early age. In 1970 he was elected president of what was then known as the Junior Bar Section. During his term, the section’s name changed to Young Lawyers Section. He is a Life Fellow of the Young Lawyers of the Mississippi Bar, serving as Fellow President in 1986-1987. In 1989, he was elected president of the Mississippi Bar. Crosthwait is a past trustee of the Mississippi Bar Foundation and is a past recipient of the Mississippi Bar Foundation Professionalism Award. He is also a member of Mississippi Defense Lawyers and a member of the U.S. Supreme Court Historical Society. Outside the borders of Mississippi, Crosthwait has served as a past member of the ABA House of Delegates. He is a Fellow of both the American Bar Foundation and the American Bar Young Lawyers division. Crosthwait has worked to improve the American justice system by serving as a past director of the American Judicature Society. He has also served as a past state chairman of the International Association of Defense Council. Crosthwait has long been an advocate for education in the state of Mississippi. He was a charter founder of Mississippi School for Math & Science. He is also a past director of the Mississippi Public Education Forum. Crosthwait was appointed by Gov. Bill Allain to serve on the Board of the Trustees of the State Institutions of Higher Learning (IHL). He would serve as president of the IHL board and also chair in 1995 the search committee that ultimately hired Robert Khayat as chancellor of the University of Mississippi. Crosthwait is a member of the Delta Council and the Mississippi Economic Council. He has also served as past chairman of the Mississippi Judicial Nominating Committee and is a past member of the Mississippi Constitution Study Committee. He is a past member of the Interstate Oil & Gas Commission and the Mississippi Research & Development Council. At Ole Miss he has served on numerous committees and held various leadership roles. He is past president of the Alumni Association and of the University of Mississippi Foundation. 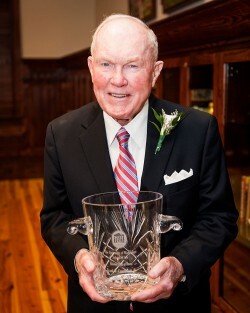 In 1996 he was inducted into the Ole Miss Alumni Hall of Fame and was presented the university’s Lifetime Achievement Award. In 2003 he was named LawAlumnus of the Year. Frank and his wife, Sandra, reside in Indianola. Clare Hornsby is a native of Biloxi, where she has practiced law for 71 years. Since 1945, she has gone to the office every morning and has become a true legend on the Coast, where she has been included in the Biloxi tour train route. Born to Croatian parents, Hornsby credits her philosophy of life of working hard and playing hard to her parents who also taught her to love God and family above all else. She attended and graduated from Biloxi High School in 1938. She attended Perkinston Junior College and continued her college education at the University of Mississippi where she received her Juris Doctor of Law in 1945. She began private practice with her brother, John M. Sekul, in 1945 and was one of the first females in the state to own her own law firm. In 1956, she and her brother were admitted to practice in all state and federal courts, including the United States Supreme Court. Hornsby served as a Master in the Chancery Court of the Second Judicial District of Harrison County, Mississippi; on Mississippi Women’s Cabinet on Public Affairs; as president of the Advisory Committee; and the Harrison County Family Court and Referee in Family Court. Professionally, her memberships include the American Bar Association and the Mississippi Bar Association. Ever the trailblazer, she was the first female president of the Harrison County Bar Association. She was also president of the Biloxi Bar Association for 16 years. Hornsby, an active member of the Biloxi Lions Club, served as their first female president and is presently the program director. She is on the Mississippi Gulf Coast Community College Foundation board and is a past president. Other civic organizations include: Biloxi Chamber of Commerce, Altrusa Club, American Cancer Society, United Fund, March of Dimes, and Biloxi Business and Professional Women’s Club to name a few. 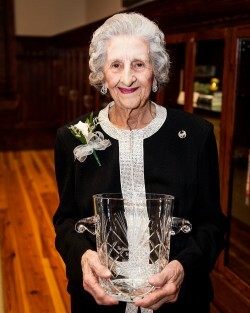 Some of Mrs. Hornsby’s numerous awards include being named Biloxi’s Outstanding Citizen, 1990; Lion’s Club Mother of the Year, 1960; John C. Stennis Chapter of the Air Force Association (first woman to serve as president); Air War College National Forum, 1971; Susie Blue Buchanan Award, 1999; Biloxi First Honoree for 2011 and recipient of the Iron Magnolia Award sponsored by WLOX Television. Hornsby also credits her success to her late husband, Warren, to whom she was married for 50 years. Clare and Warren had four children, W. Fred Hornsby II, Susie Hornsby Bass, Warren H. “Bo” Hornsby, Jr., and Yasna Hornsby Yenewine (adopted from Dalmatia,Yugoslavia). She also has nine grandchildren and 12 great grandchildren. Moss Point native Robert Khayat served the University of Mississippi from 1995-2009 as its 15th chancellor. He earned a bachelor’s degree in 1961 and a J.D. in 1966, both from the University of Mississippi. During his undergraduate years, he was a member of Phi Delta Theta fraternity and the Army ROTC program. He was an Academic All-American on Coach John Vaught’s football teams and was an All-SEC catcher, playing on Coach Tom Swayze’s SEC Champion baseball teams. In law school he was articles editor of the Mississippi Law Journal and finished third in his class. From 1960-1964, he played professional football for the Washington Redskins. In 1961 he earned a trip to the Pro Bowl. Following law school, Khayat enjoyed a successful venture as an attorney in Pascagoula. In 1969 he became a member of the Ole Miss law school faculty where he served as professor and associate dean, teaching local government law, family law, agency and partnership, federal trial practice, torts, civil procedure and wills and estates. During the 1980-81 academic year, Khayat earned a Sterling Fellowship and took a leave of absence to obtain his LL.M. from Yale Law School. In 1984, he was promoted to serve as vice chancellor for University Affairs. He then left Oxford to become the first president of the NCAA Foundation, where he served for three years. After his service to the NCAA Foundation he returned to teach at his beloved law school before being chosen as Ole Miss’ next chancellor. Under his leadership, the university experienced unprecedented growth and success. Enrollment increased 43.6%, research and development grants topped $100 million for each of the last eight years of his tenure, Phi Beta Kappa, the nation’s most prestigious liberal arts honor society, awarded Ole Miss a chapter and the university’s endowment grew from $114.3 million to $472.4 million. He played a major role in the establishment of the Sally McDonnell Barksdale Honors College, the Croft Institute for International Studies, the Lott Leadership Institute and the William Winter Institute for Racial Reconciliation. The university’s operating budget grew from less than $500 million to nearly $1.5 billion. During his tenure as chancellor, the number of National Merit Scholars more than doubled, the university produced five Truman scholars, eight Goldwater scholars, six Fulbright scholars, a Marshall and a Udall scholar, and the university produced its 24th and 25th Rhodes scholars. Ole Miss also hosted the first of three Presidential Debates in 2008. Khayat is the recipient of the Lifetime Achievement Award from the NFL and the Distinguished American Award from the National Football Foundation. He is a member of the Ole Miss Football Team of the Century, the Mississippi Sports Hall of Fame, the Ole Miss Student Hall of Fame, the Ole Miss Alumni Hall of Fame, the Ole Miss M-Club Hall of Fame and is an honorary member of Phi Beta Kappa. Law students chose him in 1993-94 as Outstanding Law Professor of the Year, and he was named Law Alumnus of the Year in 2014. Khayat became a best-selling author after writing his autobiography The Education of a Lifetime. In 2013, his book won a Silver IPPY award presented to the nation’s best memoir. Robert and his wife, Margaret, reside in Oxford. James Tucker graduated from Jackson, Mississippi public schools in 1957 and entered military service. Afterward he attended Millsap’s College, graduating in 1961 with a degree in English Literature. He attended Ole Miss Law School, earning a J.D. degree in 1966. Tucker moved back to Jackson to practice law, focusing on litigation, especially plaintiff personal injury, bankruptcy receiver matters, and criminal, both defense and prosecution, serving at some point as president of the Hinds County Trial Lawyers Association. During this period he also was selected to be an Assistant City Prosecutor for the City of Jackson, beginning a 30-year prosecution career. In 1971, Tucker left his practice in Jackson, moved to Washington D.C., and became a traveling trial attorney for the Department of Justice. From there he accepted a position as an Assistant U.S. Attorney for the Southern District of Mississippi and returned to Jackson in 1972. For the next 30 years he was a federal litigator, primarily criminal. He served as Chief of the Criminal Division for approximately 20 years, until his retirement. During this time, Tucker performed both management and litigation responsibilities. He assigned case responsibilities, designated case priorities, monitored courtroom activities, and participated in development of district criminal division practices and procedures. He also handled a significant litigation caseload, a function that included the investigation, then trial counsel in district court, and thereafter at the appellate level in the Court of Appeals, primarily the 5th Circuit. His case credentials include trials and appellate presentations involving high profile public corruption involving every level of state, county, and municipal government. During his career with the Department of Justice, Tucker often worked with Main Justice Criminal Division lawyers in matters involving corrupt public officials. He became a presenter/instructor at national seminars and course presentations involving specialized criminal prosecutions and trial techniques. He has received numerous performance awards from his client agencies and several national awards by Main Justice Washington. At one point during this service, the Mississippi College School of Law dean observed Tucker and co-counsel Kent McDaniel, now a state court trial judge, serve as federal trial counsel. He invited the two to become adjunct professors of trial practice, launching a second career that lasted 20-plus years. The McDaniel/Tucker WOWs (words of wisdom) became trial guides for hundreds of students across the State. In addition, during this 20-year span, he has been a regular at judging moot court competitions at law schools. Also during this time, Tucker was recruited by the command of the Mississippi unit of the Naval Reserve Judge Advocate General’s Corps. Thereafter, in a third career as a JAG officer, he served in a number of assignments as commander, advocate, instructor and advisor, at various duty stations around the country. He is particularly proud of his service as Staff Judge Advocate to the Commander of the reserve Seabees (construction battalions) during Desert Storm and Desert Shield. In 2000, he was appointed to serve as the United States Attorney, the high mark for his DOJ career. He retired from the Department of Justice in 2001 and accepted his current position with law firm Butler Snow. Tucker is a Fellow of the American College of Trial Lawyers. He is an active participant in the Mississippi Chapter of the American Board of Trial Advocates. Post retirement, he keeps in touch with his fellow members of the National Association of Former United States Attorneys. A longtime member of the Charles Clark Inn of Court, he recently served as a cast member in the award-winning presentation “Oh Shake-scene,” receiving a national American Inn of Courts Outstanding Program Award.